Should I buy these DVDs instead of a book on home brewing? We believe our videos can give you what no book can: a step-by-step visual walkthrough of the process. Books have the space to go into more detail, but there's nothing like seeing a batch made right before your eyes to give you confidence in your first try. Besides, you can buy the DVDs for the overview and good home brewing books for the details, and you'll be in good shape. Is the way that is demonstrated in the DVDs the only way to brew? Someone once said that if you ask ten homebrewers how to brew, you'll get twelve different answers. Homebrewing is a very subjective process, and there are many ways to get good results. What we show in the DVDs are the methods that we use to brew great tasting beer. Is it the only way? No. Who do I turn to if I have specific questions about home brewing? 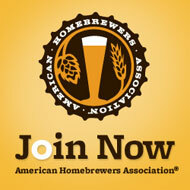 Your homebrew supply store people are great resources for your questions about home brewing. We can get you started, but a good relationship with a knowledgeable homebrew supplier can help you get past the basics. Is it legal to brew your own beer? Jimmy Carter signed a law in the 70s that made home brewing legal in the United States. However, each state has the power to regulate the hobby. Home brewing is now legal in all states, but you need to check your local laws before you get started. Also, you must be 21 years old to brew beer. Who the heck are these guys, anyway? James Spencer owns a video and audio production company in Northwest Arkansas called Active Voicing". Steve Wilkes manages the student publications at the University of Arkansas and is a fine jazz drummer in his spare time. James and Steve have been friends for well over a decade, and they started brewing at about the same time. It seemed a natural project for the two to get together to make DVDs about their shared hobby. James leads the way on the DVDs, and Steve is there to add valuable expertise.